The Kaufman County Poor Farm is one of 12 sites that Preservation Texas, Inc. has named to its tenth anniversary retrospective list of Texas’ Most Endangered Historic Places. Originally named to the 2012 list of Texas’ Most Endangered Historic Places, the Kaufman County Poor Farm is listed as threatened on the 2013 list. Preservation Texas officials announced the selections on the steps of the Texas State Capitol on Preservation Day, February 20. The annual announcement is part of Preservation Day activities organized by Preservation Texas. Advocates from all over the state come to participate in informational sessions, meet with legislators at the Capitol and get an in depth look at lessons to be learned from the sites named to the list. In 1869, the State of Texas directed the responsibility for the care of its poor residents to the counties. Many county governments created poor farms where the residents could live and work to support themselves. Today efforts by historians and genealogists have identified poor farms in various conditions. Located a few miles from the courthouse square, the poor farm was established in 1883 by Kaufman County to provide housing for its poor and indigent population. From the beginning, the poor farm offered opportunities for its residents to farm and raise farm animals. The poor farm also provided barracks for jail inmates, housed an epidemic camp and, in 1931, was used in the Farm Demonstration Program. Originally over 408 acres, the farm was usually filled to capacity and operated into the 1970s. 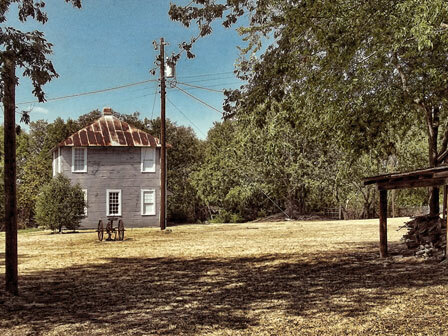 For the last 30 years, Kaufman County Historical Commission has tirelessly worked to preserve the remaining 27 acres, various 19th and 20th century buildings, and vintage farm implements. The size and complexity of the Poor Farm property have overwhelmed the efforts of volunteers as financial and human resources are scarce. Since the poor farm received its 2012 Texas’ Most Endangered Historic Places designation, a locally-sponsored wrought iron fence with sponsors’ name was installed and extensive work has been done to clean the grounds. Volunteers are working on short-term and long-term preservation plans, but further engagement of the community is needed. Sites receiving the designation receive consultation in such areas as technical assistance to identify preservation needs and set priorities, fund raising expertise, and advocacy assistance by fostering partnerships and building community support. Preservation Texas also helps to raise awareness with social media.